Incredible Lebanese fashion designer Zuhair Murad continues to impress the industry with his Spring 2015 Haute Couture collection. Pure and strong seduction literally shaped the 48 garments that Murad created in his latest haute couture collection offering for this spring. Designs were ripping with heavy embroidery, pleating and waves around the waist holding nothing but a powerful woman before our eyes. Murard clearly wanted women to turn heads with his daring collection that mainly consisted of v-necks, boat necks along with thigh high slits and figure loving silhouettes. I admire how Zuhair Murad explored dress trains with a fresh perspective; some of them were flowy, some came in huge ruffles while others were rich in floral detailing. Now for the colour palette, let’s just say a pastel fantasy. 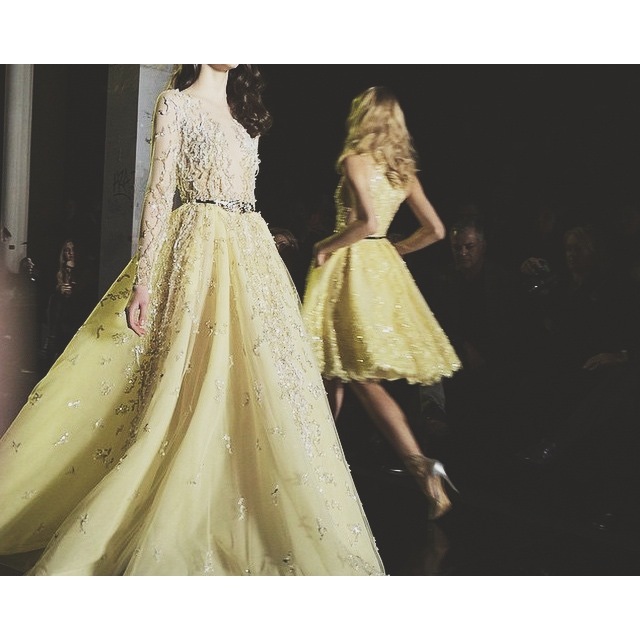 I must say Zuhair Murad’s Spring 2015 Haute Couture show was a true fashion inspiration. This entry was posted in Trend Reports and tagged couture, haute couture, paris fashion week, pfw, Zuhair Murad, Zuhair Murad COUTURE. Bookmark the permalink.